The always first to know folks at Urbanize.LA first blogged about this project on January 13, 2016 which calls for the construction of a five-story, 328,000 sqft building containing about 275 residential units in the first phase. The second phase would consist of a 12-story, 180 ft tower with 80,000 sqft of commerical space. Also included are 480 parking spaces with 401 spaces for residents and 79 spaces for office tenants. This project will be located at 6041 - 6045 Variel Ave just behind Fry's Electronics and the Panavision Offices near Oxnard St. This project was initially presented to the Woodland Hills Warner Center Neighborhood Council back on January 7, 2016 with plans for filing to the City's Planning department in February. I have not seen or heard anything since so I am assuming that this project is too going through iterations. One thing to keep in mind is that this project is inline with the Warner Center 2035 Plan so it will most likely get approved. The timeline for the project and the developer are unknown at this time. However, the number of mixed-use projects in this area is staggering and by 2035, this area will truly be unrecognizable. The current property measures 53,320 sqft on a total lot size of 130,781 sqft built in 1973 which is owned by Selective 6041 Variel LLC. The LLC purchased this property from Toluca Moorpark LTD on May 9, 2007 for $11,575,000. 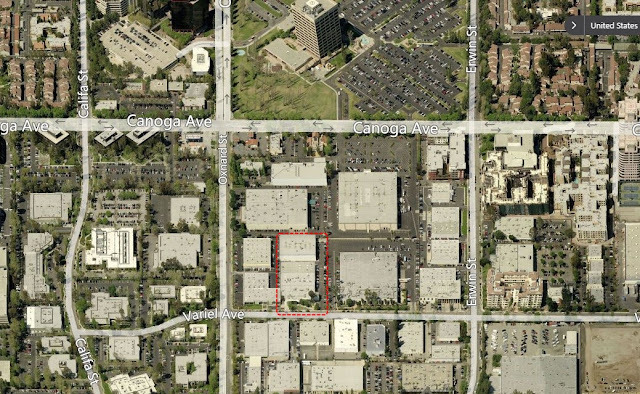 No Comment to " Another Mixed-Use Project Planned for Warner Center Behind Fry's Electronic's "